Scarborough Castle is beautifully situated on the cliffs overlooking the North Sea and Scarborough. Medieval monarchs recognised Scarborough as an important fortress that guarded the Yorkshire coastline, Scarborough’s port trade, and the north of England from Scottish or continental invasion. Scarborough dates to a 4th-century Roman signal station, one of several on the Yorkshire coast. Prominently located on the headland at the cliff top, to warn of approaching hostile vessels, and took advantage of a natural source of fresh water which became known as the “Well of Our Lady” The castle grounds are reputed to be haunted – by three ghosts, among them a Roman soldier. English Heritage promises to take you back to these times which a great weekend in August. Large wave pool, warm outdoor garden pool, Splash and Play area or stunning outdoor infinity pool. Under 6’s go free but they are not allowed on the slides. Amelia’s runs a variety of chocolate workshops all year round. Betton Farm is a Visitors Centre, Tea Room, Farm shop, Farm Yard and playground. There are plenty of things to do and see even in wet weather. The farm animals are always a favourite with the children especially in spring time with our newly born lambs and piglets. With chickens, goats, guinea pigs and rabbits children can get close to their favourite farm animals. Large grassed play equipment area with climbing frames and slides. For the under 5’s there’s a wide range of small ride on bikes and cars to play on. Dexters provide a professional, surfing experience, all year round, to people from all walks of life. The Surf lessons offered is designed by the ASI team to be educational, rewarding and fun, helping people to try something new, advance on what they know already, or just to get out there in the water and have fun. £26 per person. Participants are “locked” in a room, and have only sixty minutes to solve a series of clues, puzzles and riddles to enable them to successfully complete their mission and ‘escape’ the room – and so win the game. We recommend that groups of under 16s should have at least one adult in their team. Based in Scarborough, North Yorkshire we offer a wide range of events, including fossil hunts, rock pooling trips, dinosaur footprint walks, etc. Their experienced leaders will be able to show you the amazing secrets hidden on our coast, from 180 million year old fossils and Jurassic dinosaur footprints to the creatures that call it home today. Ideal for families, small groups and birthday parties! Indoor soft play area with junior, toddler and baby areas. Every evening from 6pm Laser Tag is run. Historic seaside miniature railway, offering a wide range of attractions including the Sky Trail, Boating Lake and Historic Water Chute. 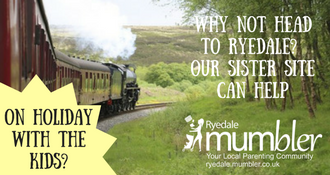 Operating trains since 1931, taking passengers for around ¾ mile from Peasholm Park to Scalby Mills stations, offering beautiful views of Scarborough’s North Bay. We are 100% wheelchair and pushchair friendly. Dogs are welcome at the North Bay Railway but must be kept on a short lead. Great place for a children’s party too. Includes FREE entry to the farm. Killerby Grange, Station Road, Cayton, Scarborough, YO11 3TL 01723 586351. A family friendly place for people of any age or artistic ability to come and explore their creative sides. Fun relaxing and creative studio for children’s parties, hen parties and babies hand and footprints. Create original personalised presents for birthdays, christenings, weddings, anniversaries ( the 9th wedding anniversary is pottery!) Valentines Day, Mothering Sunday and Fathers Day. We also offer clay imprints and activities. Gift vouchers are also available for a unique present or new baby gift. A superb local farm shop filled with amazing local produce. A Cafe, courtyard of animals and play farm all wait to be discovered. Redcliffe Farm, Redcliffe Lane, Lebberston, Scarborough, YO11 3NT. The Rotunda Museum is full of fascinating objects, from fossils found on East Yorkshire’s Dinosaur Coast to Gristhorpe Man, the skeleton and coffin of a Bronze Age man, which is the best example of a tree burial in Britain. Visit ‘The Gateway to the Dinosaur Coast’ to meet the residents of Jurassic Scarborough and come face to face with the Speeton Plesiosaur – a marine reptile from the lower Cretaceous period, found near Filey. Scarborough Art Gallery houses the borough’s permanent collection of fine art, as well as having regular events for children, especially during the holidays. Experience the high-level thrills of the North Bay Railway’s Sky Trial Adventure, one of only a few in the country. If you’re after an adrenalin rush, rise to the challenge around our 2 level rope bridge and beam course. Safety Rules are in place for your benefit and enjoyment. The Sky Trail Team will be there to advise and assist. You must be at least 5 years old and 1m tall to use the Sky Trail Adventure. Adventurers less than 1.2m tall must be accompanied by someone aged 18 or over, 1 Adult can accompany 2 Children maximum under 1.2m. Situated between the Yorkshire coastal resorts of Scarborough and Filey. Discover the history of and see how stained glass is made, learn how to make stained glass and fused glass in our new class room. Visit our extensive showroom for lampshades, mirrors and gifts, relax in our tearoom and gardens, hot daily specials, freshly baked cakes and scones. The Scarborough Fair Collection hosts a magnificent working collection of Vintage Cars, Steam Engines, Vintage Fairground Rides and Mechanical Organs topped off with a ‘Mighty’ Wurlitzer Organ in our spacious ballroom. Set in the scenic grounds of the Flower of May Holiday Park on the coast road between Scarborough and Filey. Here at the museum we have a well stocked tea bar providing, sandwiches, cakes and lavish afternoon teas. Sit in the ballroom and be entertained by the vintage dance organs while you eat. Once you’ve had a look around the museum, make the most of your day and take the little one(s) swimming too! The indoor pool on the Flower of May is open to the public!